↑ Not recognised by the Three Powers: สาธารณรัฐฝรั่งเศส, สหราชอาณาจักร and the สหรัฐอเมริกา. ↑ Eugene Register-Guard 29 October 1989. p. 5A. ↑ Grix, Jonathan; Cooke, Paul (2003). East German Distinctiveness in a Unified Germany. p. 17. ISBN 1902459172. ↑ Peter E. Quint. The Imperfect Union: Constitutional Structures of German Unification Princeton University Press 2012, pp. 125-126. ↑ "More Than 1,100 Berlin Wall Victims". Deutsche Welle. 9 August 2005. สืบค้นเมื่อ 8 August 2009. ↑ Berlin Korrespondent. "Nationale Front in der Ostzone". Die Zeit, June 1949. สืบค้นเมื่อ 10 May 2013. ↑ The use of the abbreviation BRD (FRG) for West Germany, the Bundesrepublik Deutschland (Federal Republic of Germany), on the other hand, was never accepted in West Germany since it was considered a political statement. Thus BRD (FRG) was a term used by East Germans, or by West Germans who held a pro-East-German view. 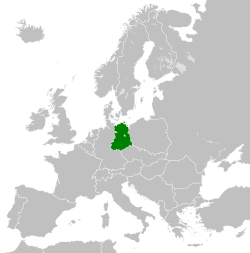 Colloquially, West Germans called West Germany simply "Germany" (reflecting West Germany's claim to represent the whole of Germany) or, alternatively, the Bundesrepublik or Bundesgebiet (federal republic, or federal territory, respectively), referring to the country, and Bundesbürger (federal citizen[s]) for its citizens, with the adjective, bundesdeutsch (federal German). ↑ Lora Wildenthal. The Language of Human Rights in West Germany. p. 210. หน้านี้แก้ไขล่าสุดเมื่อวันที่ 20 เมษายน 2562 เวลา 11:00 น.